Vitantonio Liuzzi has said that he is not surprised that his drive with Scuderia Toro Rosso will be taken by Sebastien Bourdais next year. In fact, it would have been more surprising if he had not been aware that, for several months, his bosses have been doing everything in their power to replace him with the Champ Car champion. Although there is usually little interest in driver changes in teams that inhabit the lower end of the grid, this one has assumed some importance because it brings into F1 a man with an impressive record and reputation. Bourdais' three championships in the States and perhaps one more to follow this year make a good resume and many have said that he should have been given the chance to break into F1 much earlier. He is facing a formidable task, however. His team mate, Sebastian Vettel, is one of this year's crop of talented youngsters who have shown surprising pace as soon as they entered the sport. It is inevitable that Bourdais' performances will be compared with Vettel's and little allowance will be made for the fact that the young German has a head start in learning the ropes of F1. These days new drivers are expected to produce results very quickly, thanks to the meteoric rise of Lewis Hamilton. The STR bosses have shown little patience too in their quest to advance up the grid and Gerhard Berger has hinted that he will lose interest if the team does not begin to show improvement soon. Since their previous drivers, Scott Speed and Liuzzi, are blamed for STR's lackluster performances to date, it is pretty clear that the new incumbents will be expected to make a big difference. 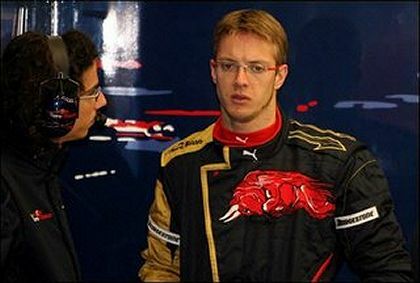 To me, it looks like an impossible task confronting Bourdais. For any driver to make an impression in F1, he has to be given a car that will at least make it to the finish and, this year, the STR-02 has been notable mainly for unreliability. The potential is there, as demonstrated by the Red Bull version of the car and its recent scoring of points, but Toro Rosso seems to have gone backwards relative to its sister team. To preserve his reputation, Bourdais will have to galvanize the team into developing and preparing the car better than they have done so far, then beat his team mate on the track and, ultimately, score the points that his bosses crave. For a driver in his first season in F1, that is a very tall order indeed and, if Bourdais manages it, I will be very impressed. And that is in spite of my support for Speed as a driver who I think far better than his STR bosses ever realized. I have said before that I expect both Vettel and Bourdais to produce results no better than their predecessors and I will not hold back from saying I told you so if it happens. But I am also aware that it is an unfair test for the new drivers; if Speed is as good as I think he is, it will be no shame for Bourdais and Vettel not to outclass him or even Liuzzi. But that will not matter to STR - they want results and they want them quickly. In the event of Bourdais and Vettel proving no better at dragging the car up through the midfield pack, they will soon be viewed with suspicion in their turn and their reputations suffer accordingly. So I wish Bourdais and Vettel well; I really do hope that they prove me wrong and manage to provide the sudden upturn expected of them. I consider Vettel in particular to be a driver of precocious talent and I will get no pleasure if he fails at STR. That would merely be yet more wastage of brilliant potential by the impatient and short-sighted managers of the team. Bourdais and Vettel reinject an excitement into STR that has completely disappeared this year. It's unfortunate that I continue to believe without a trace of doubt in my mind that the Torro Rosso car will be a piece of garbage next year, too. Here's hoping the driving talent keeps them ahead of Prodrive. And that's if Prodrive even make an appearance - there is some doubt that they will be able to put together an agreement for a chassis before next season.